The Salon Art + Design, one of the premier showings of contemporary art and design, is bringing a certain pop to its 2018 fair. The fair will take place from November 8 to November 12 at 56 galleries worldwide, from their headquarters in New York, to Paris, Cape Town, and many others. In what many present-day artists are referring to as “Maximalism,” The Salon will showcase a series of vibrant, colorful, and eclectic pieces by a range of artists from various time periods. This new phase in our era of artistic creation rejects notions of minimalism long sought after by artists throughout history. Instead, these pieces evoke whimsical emotions through sometimes chaotic optics. Take Surrealist Head by Alexander Calder (1898-1976), circa 1960. This piece rejects all conventions of forgery, instead a suspended sculpture that focuses on the absurd. The colors, while simple, evoke a warm-to-cool contrast, and the blue tongue sticking out of the head’s mouth seems to be mocking the very art this piece stands to reject. Surrealist Head will be shown at Galerie de la Béraudière in Brussels. Such a trend is often found within furniture design as well. 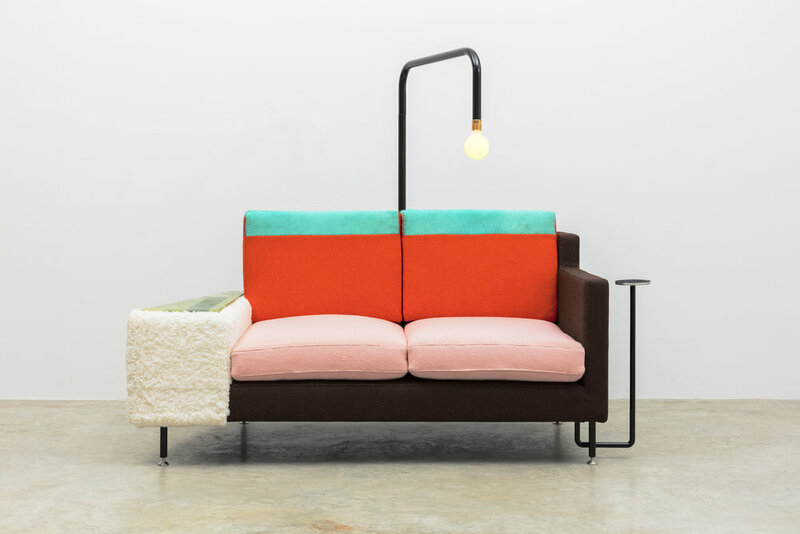 Galerie BSL in Paris will be showing a “Crescent Loveseat” by Charles Kalpakian, first manufactured in 2017. The piece features a dramatically subtle curve, upholstered in a sleek blue and featuring popsicle-stick legs. Friedman Benda in New York will also show the eccentric works of Jonathan Trayte. This showing will include an array of pieces, including Fruiting Habits, a bed featuring an assortment of flamboyant hues, most notably a cream pink accenting otherwise white framework and a variable-colored bedspread complete with a custom wave pattern. Fruiting Habits even includes its own light installation: a single bulb sprouting from the framework and hanging atop the bed. Trayte’s commitment to Maximalism can also be seen through his Weekend Special, a couch with equal parts character and zest. This piece features shades of pink, orange, teal, and includes a variety of textures seemingly clashing and complimenting one another simultaneously. Characteristic to Trayte’s work, this piece also features a hanging lightbulb, emerging from beyond the upholstery. In terms of pottery, the J. Lohmann Gallery in New York will be showing the exciting Innuendo by Heike Brachlow, circa 2017. This glass creation features what appears to be a pair of loosely opened lips, an accompanying red gradient only adding to the perception. However, Innuendo evokes much more than observations of sexuality, for one can get lost in the neutral contrast of red to white created by the use of blank space. These are merely a hand-picked selection of some of the great pieces to be shown this year at The Salon Art + Design Fair. The Salon Fair only happens once a year, and the directors are committed to showcasing of relevant trends in the design world. This year is sure to be a similar examination, the likes of Color Pop and Maximalism at the helm of their most notable showings.